In 1895 Nikola Tesla’s lab in New York burned down. He lost all his research and so many hours of working and laboring, gone. He was even about to give a demonstration about his long-distance wireless receiver a few days later. He was discouraged. The fire was a turning point. Before the fire Tesla had many successes, but after the fire he ENCOUNTERED many failures.
" Utterly dishearten and broken in spirit, Nicola Tesla [sic] , one of the world's greatest electricians, returned to his rooms in the Gerlach yesterday morning and took to his bed. He has not risen since. He lies there, half sleeping, half waking. He is completely prostrated." --New York Herald, March 14, 1895. New York Herald, March 14, 1895. Tesla’s greatest achievement was overcoming difficulties in his life using his tenacity and drive – the compulsion to continue his work despite obstacles, financial insufficiency, patent infringement, and more. Overcoming those obstacles insofar as his work was concerned is a huge achievement." — Personal Student interview with Jane Alcorn, President of the Tesla Science Center at Wardenclyffe.
" I am completely worn out, in fact, and yet I cannot stop my work. These experiments of mine are so important, so beautiful, so fascinating, that I can hardly tear myself away to eat, and when I try to sleep I think about them constantly. I expect I shall go on until I break down altogether." — Nikola Tesla, quoted in Outlook magazine, March 9, 1895.
" 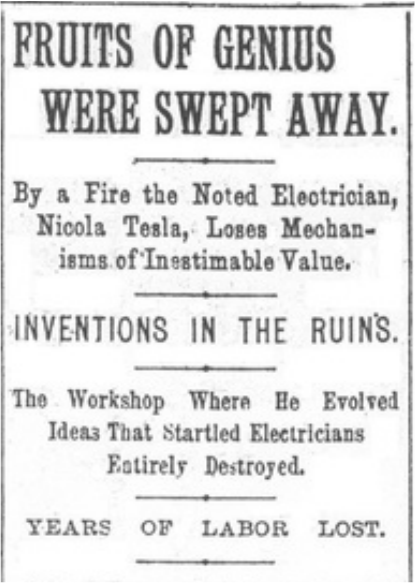 The destruction of Nikola Tesla's workshop with its wonderful contents, is something more than a private calamity. It is a misfortune to the whole world. " —Charles Dana, New York Sun, March 14, 1895.